Fever midcourt star Verity Charles has been cleared of serious injury. WEST Coast Fever has received a major boost ahead of their semi-final clash with the Giants on Saturday with one of their star midcourters cleared of serious injury. 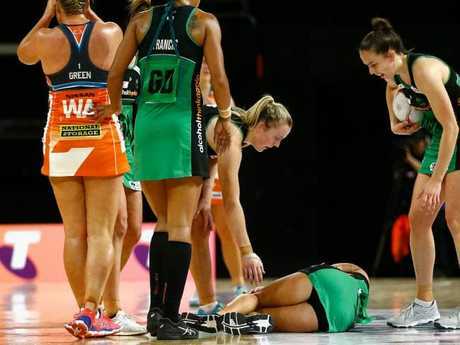 Wing attack Verity Charles tangled with Giants captain and former Diamond Kim Green in the dying minutes of last Saturday's clash between the two teams, injuring her knee in the match won by the Giants. 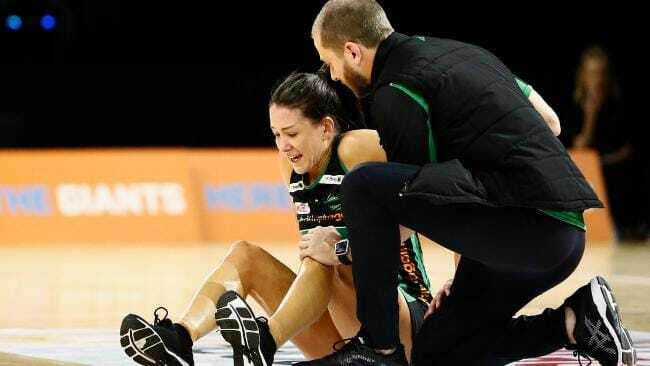 Charles was helped from the court in obvious pain but her knee has now been cleared of major damage in good news for the team heading back to Sydney on Thursday to prepare for the Super Netball major semi-final. "She's good. She got through some footwork which is good news,'' said Fever and Diamonds defender Courtney Bruce. It's is expected both clubs will field full strength sides on Saturday at the Quaycentre at Sydney Olympic Park in a match which will determine the first team into the season decider on August 26..
Verity Charles hits the floor against the Giants. Giants defender Sam Poolman said the Sydney team is determined to make winning the minor premiership and earning hosting rights to the semi-final count. "Last year with a couple of weeks to go we were in a position to win the regular season but we lost a couple of games and the advantage," said Poolman of the Giants' third place finish in the 2017 regular season. "This year we have the advantage so there is a lot on the line and we want to make the most of it."